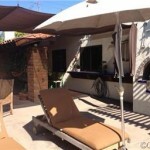 Just Leased: 2 Bedroom Adobe in SJC! 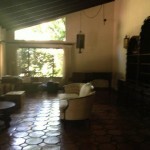 Home » South Orange County » Just Leased: 2 Bedroom Adobe in SJC! Just when you thought top Orange County realtor Cheryl Marquis was busy selling a few homes, listing a few others, and leasing another handful (let’s not forget property managing several more), she leased another gorgeous south Orange County home! Seriously, who knew there were so many hours in the day?! 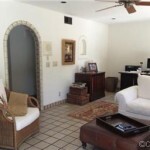 Her newest lease is a fabulous Spanish Hacienda single level home located in the heart of charming San Juan Capistrano. The 2 bedroom , 2.5 bath Spanish Adobe is authentic and charming — just like its hometown. Over 2.300 square feet of living space means plenty of room for an OC family to enjoy each other’s company while still allowing for plenty of privacy. The master bedroom has private entrance to outdoors and the master bathroom is complete with a steam shower. OC living at its best! The formal dining room opens to an atrium with fountain. How could a family not fall in love?! 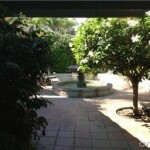 Additionally, the backyard is every family’s dream: the secluded, private gated courtyard leads to a large lap pool. A large deck with a built-in BBQ is perfect for entertain friends and family. Or sunning in the privacy of your own backyard! What’s more, this wonderful home is within walking distance to the famous Mission, schools, restaurants, train stations, toll roads and downtown San Juan Capistrano. Additional perks include an inside laundry room and attached 2 car garage with ample parking in driveway. Whether you are looking to buy, sell, lease, or rent in Orange County, experienced real estate Cheryl Marquis can help you. Contact her to discuss creating the dream OC lifestyle for you and your family today.